In a previous post, I wrote about the essential avocado oil benefits for the skin! But is avocado oil good for hair, as well? 1. Why should you miss a lot, if NOT using avocado oil for hair treatment? 2. 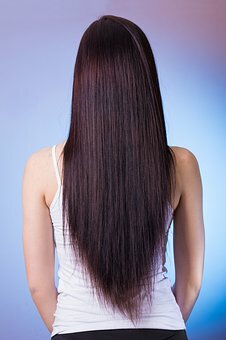 How to apply avocado oil on hair, utilizing homemade recipes? 2. How to use avocado oil for hair, purchasing high-quality natural cosmetics? I’ve already had a chance to depict how valuable are avocado (fruit & oil) properties. In a nutshell, it is rich in fibers, vitamins A, B, C, and minerals, like zink, iron, copper, magnesium, potassium, folic acid. It is full of antioxidants and reduces the oxidizing of the body. Now I will touch this topic from “benefits for hair” perspective. The reasons for having hair issues could be versatile. It might be your diet, the water you use, the atmosphere conditions, your genetics, or the shampoo and cosmetics you use! 1. Did you know; with avocado oil, you can improve your hair growth? It is rich in fatty acids, (like oleic acid) which play an essential role in that direction. 2. Due to its hydration power, avocado oil can deeply penetrate the strands and moisturize the hair. 3. You can easily comb your hair if treated with avocado oil. For the purpose, it could be mixed with almond oil in 1:1 ratio. 4. Avocado oil is an enemy of dandruff, itchy scalp, and hair loss. Here vitamin E and B are the ones that help a lot! Vitamin B keeps the strands growing, and vitamin E improves the damaged hair. 5. Massaging the scalp with avocado oil brings more blood to the hair follicles, thus nourishing them and keeping the hair shiny and healthy. Even if you don’t have the time to make your own mask, you could add avocado oil to your natural cosmetic product, and apply on your hair. Now you know what a treasure you have! Let’s move to the next step. How to prepare homemade masks with avocado oil? Here I will show you a few easy and quick recipes, to utilize avocado oil. You will need 2 tablespoons avocado oil, 1 tablespoon honey, 1 tablespoon almond oil, 1 egg. Mix all ingredients and massage the strands from bottom to top. Leave for 20 minutes and wash with shampoo. You will need 1 tablespoon avocado oil, 1 tablespoon olive oil, 1 egg white. Mix all ingredients and apply massage the strands from bottom to top. Leave for 15 minutes and wash with shampoo. You will need 3 tablespoons avocado oil, 2 tablespoons jojoba oil, 1/4 ripe avocado (optional), 2 tablespoons lime juice. Mash the fruit and mix with the other ingredients. Put the blend in a pot and warm it up to body temperature in hot water. Apply on wet hair, massaging the strands from bottom to top. Wrap your hair with an old towel for 20 minutes, and wash with shampoo. You will need 2 tablespoons avocado oil, 1 banana, 1 egg. Mix the ingredients and apply on hair for 20 minutes. Wash with shampoo. You will need 2 tablespoons avocado oil, 3 tablespoons shea butter, 3 tablespoons apple vinegar. MIx all ingredients and apply on your hair for half an hour. Wash with shampoo. Thus you will nourish, control, and comb your curls easier. 1. When you mix avocado fruit with yolk, make sure the blend is homogeneous, without lumps. Otherwise, it could be harder for you to wash the fruit away from the strands. If still any problems occur, use a wide tooth comb. 2. Don’t use hot or warm water to rinse your hair. Thus you could “boil” the egg in the mask, and make it harder to wash it. 3. Let hair get dry naturally, after the procedure. Using a hair dryer will reduce the effect of the mask. 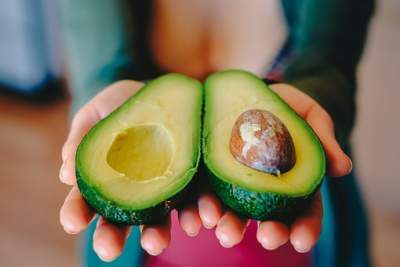 How to use avocado oil in natural cosmetics? 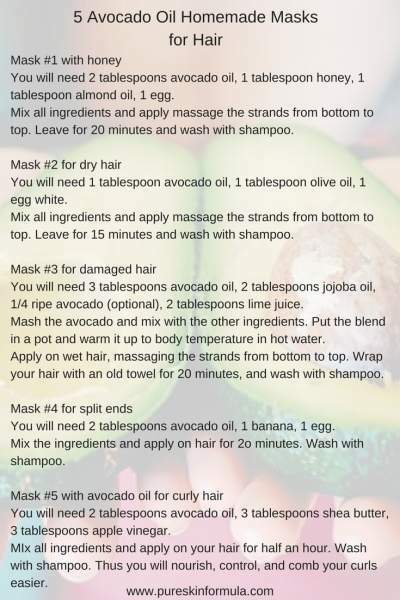 Preparing homemade masks is not the only option to utilize the fantastic avocado oil properties for hair. The other way is to search and find premium natural cosmetic products. Let’s be honest – sometimes you don’t want to deal with losing time and effort in preparation DIY recipes. There is an even stronger argument to use active natural products – they are with proven and enhanced formulas, using many and versatile compounds, in proper ratios, leading to a maximum effect. You may think, there is always a risk to use fake, or low-quality cosmetics. And you will be right! The good news is if you follow these rules, you will know how to find “golden nuggets,” among many products on the market:) Just do it, and you will be fine! Is avocado oil good for hair? You bet! Using avocado oil for hair and skin is one of the most beneficial steps you could make regarding your health care and good look. Don’t miss this opportunity nature gives you! It hardly has side effects, it is full of valuable components and can make miracles for you! You already know 5 homemade solutions how to use avocado oil. You also know how to find high-quality natural cosmetics. Your next step? Take action and experiment! Find what works for you, and apply it! It’s that simple! I would love to hear from you! Do you (plan to) use avocado oil for your hair? Write me a comment, and I will answer you! Very interesting. Never thought of putting avocado on my hair. But it sounds like a very natural way to beautify & strengthen mid to long hair. I’m passing this along to my daughters-in-law as they both have very long hair. Thanks for “putting-a-new-wrinkle-in-my-head” today. I love learning new trends. BTW, the site looks great too! And yes, it may sound a bit strange to put avocado on your hair, but it is one of the most powerful allies we have on our side, irrespective whether we take it internally, or externally! Great article, made me hungry actually haha I love avocados. It really is crazy we make all of the things for the body from chemicals and such and in the end its products we find in nature that do as good if not better jobs and are 100% more healthy for us. Agree with you:) We can use avocado both internally and externally, and I am wondering which way is better:) I am joking, but the truth is it will be a crime avoiding it! You might also want to check about ginger root and angelica root. I never knew that avocado or avocado oil is great for my hair and thank you for this! My hair is getting a bit thinner and I will definitely try one of your masks. I have used avocado essential oil but never for my hair, and it’s good to know that the fatty acids in the avocado could help with hair growth. Will try this out and thanks for this great info! Another great article. I love your website. Going thru a medical issue and loosing quite a bit of my hair, I have been looking for ways to help it grow back and be strong. I love the masks you have listed and this is definitely something I am going to try. Thank you so much for sharing! Wow. I never knew that avocado oil was good for hair. I personally have an issue with dry itchy scalp so I bookmarked this page in order to reference it for all the remedies that you shared. Great information! Thank you for stopping by! 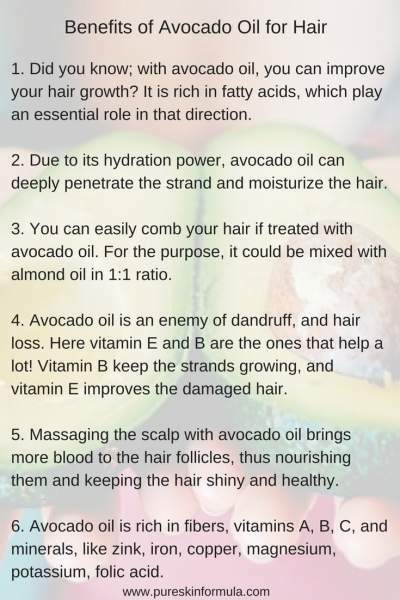 Yes, avocado oil is excellent for hair! You can always come to the website and see the information. You might also want to check the other posts – each of them is devoted to a specific topic and has a lot of useful insights, facts, tips, masks, recipes for your hair care and skin care! The avocado really seems to be a magical fruit. Delicious and healthy to eat, excellent for the skin and by having read this blog I have learned that it also makes beautiful hair. How amazing that avocado improves the hair growth and can repair hair damages. That sounds perfect for me, having long hair makes the ends split easily. But I wonder, isn’t it difficult to wash away the oil? I don’t like the feeling of fatty hair. I love though, having shiny and healthy hair. To answer your question: it is very easy to wash away avocado oil from your hair:) Don’t worry about this, and use it with pleasure!